Practicing medicine isn't an easy or straightforward profession regardless of the specialization, but there's a vagueness and complexity to gastroenterology -- the digestive tract -- that could understandably drive doctors mad, where benign conditions share symptoms with more serious ones that patients are concerned about. Even if all they must deal with on a day-to-day basis is their consultations and consolations with nervous patients, that'd understandably be enough to challenge their mentality, let alone dealing with the business aspects of running an office and coping with child custody amid divorce. This proves to be a truly distinctive setting for the happenings in Bluebeard, a South Korean neo-noir thriller in which a gastro doctor gets tangled up in a series of disappearances, in which the elements of his profession play a key role in the moving parts of the suspense. While novel in concept, the questionable framing of characters and outlandish execution of the twists and turns make the suspense a strain to push through. Coming off his distinctive role as a perverted and controlling older aristocrat in The Handmaiden, Jo Jin-woong embodies the film's doctor, internist Seung-hoon, who recently moved to Gangham to take a position at a fairly busy clinic. When he's not performing colonoscopies or doling out vaccines, he's struggling with his ex-wife to spend time with his son, living out of a cramped and cluttered apartment due to his dispersal of funds. 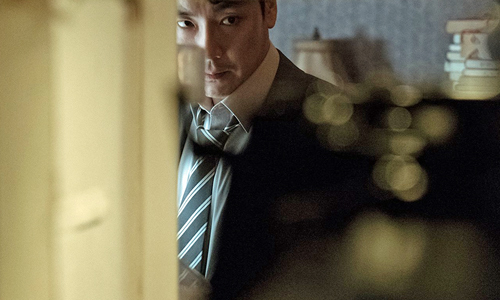 During one of his scope appointments, a patient under anesthesia -- the father (Shin Goo) of a local butcher (Kim Dae-Myung) and his co-landlord -- lets it slip that he's committed murder, perhaps regarding an significant unsolved case in the area. Discovery of this information changes Seung-hoon's approach to his landlords, sparking his suspicion of all of them while he maintains something of a loose social relationship with the son. Seung-hoon's mental state begins to observable degrade as he copes with these problems, which come to a head one fateful, unremembered night after drinking. While noir and neo-noir type of films like Bluebeard traditionally have a complicated, flawed hero at the center of their stories, there's usually something admirable or engaging to root for within each one, whether it's a melancholy motivation for their actions or their suave composure or skill under duress. From the second he removes his medical mask and we're given a direct glimpse at him, there's consistently something off about Seung-hoon's mannerisms, lending him a disagreeable and anxious presence that has the unlikability factor without the positive merits as a counterbalance. Put bluntly, he always acts in a suspicious manner, raising red flags as he interacts with his nurses and his landlords. This sets a tone of unease long before the mysteries kick into gear, amplified by Jin-woong's cautious and reactionary performance. Even though there's little reason to suspect anything at this point, reliability becomes an issue, and a deliberate one. There's some outside-the-box cleverness involved with how writer/director Lee Soo-youn incorporates the facets of a gastro medical practice into the evolving mysteries of Bluebeard, from the medications and frequency of doctor visits to how patients talk under anesthesia while undergoing a colonoscopy. The information revealed by a patient while knocked out moves beyond being clever and into outright unreasonableness, though, complicating matters since so much of the premise's forward movement relies on this sedate disclosure. Without his explicit description of details central to confirming his crime, and without several layers of convenience that ensure the doctor's the only one who heard it, the film's premise would come apart at the seams. When combined with Seung-hoon's jumpiness, it's hard not to view anything that transpires in Bluebeard without a degree of skepticism, stretching beyond the boundaries of compelling red herrings and second-guessing that comes with the territory. Turns out, unsurprisingly, there's a reason for all the concealment of details and general oddities in Bluebeard, as the twists and turns that emerge take the storytelling in a starkly different direction, hinged on mental illness and the things one does when under the influence of alcohol. Lee Soo-youn's craftsmanship results in a polished, smartly-edited progression of events that do utilize skepticism to its advantage, using the established dangers of Seung-hoon's situation for disturbing events to unfold. The extents of the script's deceitful thrills and the destination in where they're headed are remarkably unconvincing, though, combining the nihilistic undertones of noir cinema with the twist-dependent heaviness of something from Shyamalan or Fincher. What results is messy, perplexing suspense that attempts to have it both ways with the answers given, which comes across as the director tricking and toying with the audience's perception of what they've been told and observed. Bluebeard ends exhibiting the vague symptoms of an excessive psychological thriller that needed different treatment.